Everything we’ve released to support the game so far is kept here. What is the Ogre video game? Made in partnership with Steve Jackson Games, Ogre is Auroch Digital’s digital adaptation of the classic tabletop wargame. 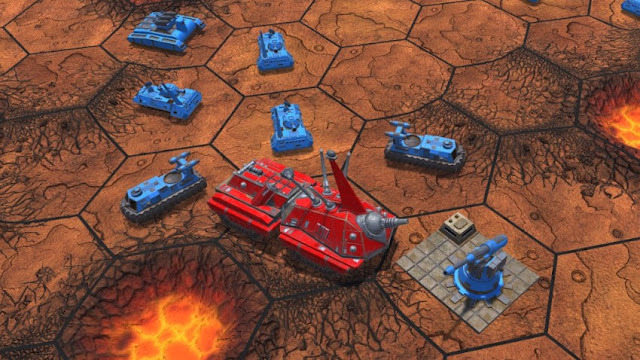 Ogre is a turn-based strategy game set in the near future, where infantry, hovercraft, tanks, and deadly cybernetic behemoths called Ogres, do battle. Ogre requires tactical precision and strategic planning, whether in the single player Skirmish and Campaign modes, or against opponents across the world in asynchronous multiplayer. Ogre’s straightforward rules and strategic depth are part of its genius, and the reason for its lasting appeal. A player moves their units up to their maximum movement allowance, taking into account the various types of terrain hexes on the map such as craters, forests, towns, and so on. In this phase players can choose to perform Ram and Overrun attacks with their vehicles. Units that are in Swamp, Rubble, or Forest terrains check to see if they have become immobilized. If so, they are unable to take part in attacks. All player units may attack their chosen targets. Players attacking with an Ogre choose which tanks, infantry, or other targets to fire upon; those going up against an Ogre unit attack certain parts of the Ogre such as the tracks or guns. Whether the attack is successful or not is determined by a table of possible results based on a die roll, modified by vehicle type, weapon class, and more. Speedy units called G.E.V.s (ground effect vehicles) then get to move again, making them nimble opponents. The player then passes the turn over to their opponent. At the beginning of the player’s next turn, Disabled units have the opportunity to recover. The game then returns to the Movement Phase. How faithful is this adaptation? Very faithful! In 1977, Ogre’s clear rules made wargaming accessible to a wide audience. This digital adaptation takes that approach even further by automating a number of the processes and elements of administration in the physical game. These changes increase the pace of the experience and make turns quick and effortless even for new players, while keeping the rich strategic choices that Ogre veterans expect. What content can players expect to see? The digital adaptation comes with a wealth of units, including: Light, Heavy, Superheavy, and Missile Tanks, G.E.V.s, Infantry, Marines, Howitzers, and Ogres (Mark I through Mark VI), plus Trains and Command Posts. Players can play as either The North American Combine or The Paneuropean Federation, upon a variety of maps bursting with tactical opportunities. A generous Campaign called Nightfall, specifically written for the video game, awaits commanders in single player, as does a Skirmish mode that allows players to setup games of Ogre with specific conditions. A tutorial is on-hand to teach new players the fundamentals of the game as well. And when ready, players can take their skills online to compete against people around the world.